Update: A point clarification, only those who requested libraries initially will get one for free. We are accepting no more requests for the complimentary libraries. 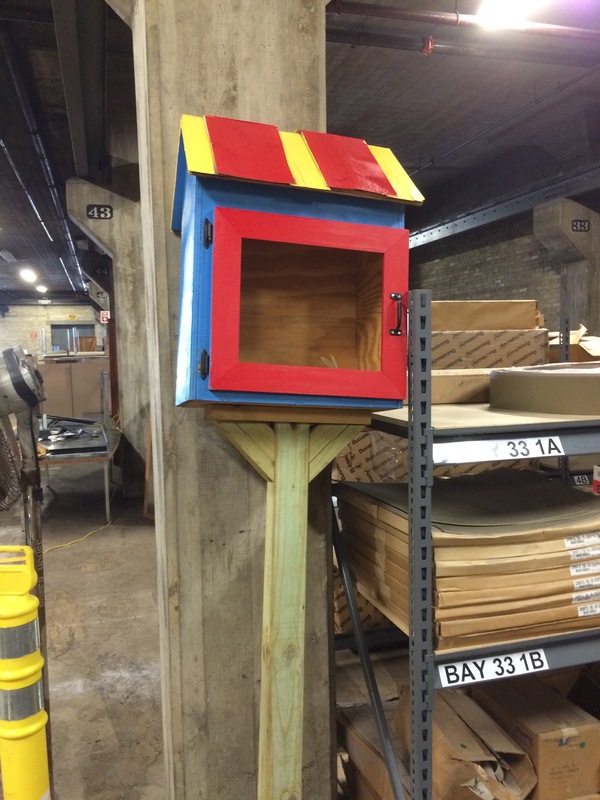 So, you might remember in June that we put a call out to local residents interested in giving Caterpillar’s former Little Free Library a good home. We had a great response. Eleven people said they wanted one of these in front of their homes! Well, we’re proud to announce that everyone who initially asked for one, will get one. That is due to a generous donation of time and expertise from local woodworker Larry Oleson. I just met Larry a few weeks ago, and if you’ve driven down 15th Avenue near City Hall over the years, you may know some of his work. His carved wood (and some metal) pieces adorn the front of his house 2413 15th Ave., and he has even more terrific works in his garage, from tables and chairs to wooden animals. He’s also no stranger to Little Free Libraries. He’s constructed more than a dozen over the years. So when I asked him about taking this on, Larry was more than happy to help. So was Ace Hardware, which is donating paint and stain for the project, and the South Milwaukee Library, which is donating some of the wood (from old library shelves) that Larry will use and provide some books for the libraries, as needed. The plan: Larry now has the list of people who expressed interest in the libraries and will begin construction soon. The goal is to have everyone their free library by the time the snow flies, starting with the one from Cat. I am really excited about this community partnership, and I want to thank Caterpillar, Ace, the library and especially Larry for his contributions. This is why I love South Milwaukee! Be sure to check out Larry’s work for yourself at his home. Give him a call first at 414-764-6786. Tell him I said hi, and please thank him personally for stepping up to help with this project. Very very cool. Thank you. We’ve wanted to put one at our home along the parkway for awhile now. Except we want a custom design. I wonder if Larry would do a custom for us? Charlotte: That sounds really neat. I am sure Larry would help out. Please do give him a call. I have an antique store on Milwaukee Ave and would love to put one in front of the store. We put a bench out front for the children to sit and read. Our address is 916 Milwaukee Ave.